CLOVIS – The St. Jude Dream Home will be open Wednesday through Friday from 12 p.m. – 9 p.m. and Saturday from 9 a.m. -5 p.m. This is the final week for free public tours of the beautiful house built by major donor and sponsor De Young Properties. Just for touring the home, visitors can enter for a free chance to win a $10,000 shopping spree at Ashley Furniture HomeStore. Only 10,500 tickets are being sold so odds are amazing to win. People interested in reserving a ticket are encouraged to do so before the deadline this week. The approximately 3,3000 square foot, 4 bedroom, 3 bathroom home located in the De Young CountryCourt community in Clovis, will be raffled for the benefit of St. Jude Children’s Research Hospital on KMPH FOX 26 this Sunday, November 10 at 5 p.m. Other prizes include a $1,000 Visa Gift Card, courtesy of Affinity Dental, $1,000 to Tint Plus Auto Glass, $1,000 shopping spree to Anna’s Linens and many more valuable prizes. 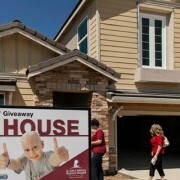 For a complete list of prizes, visit www.dreamhome.org. Tickets can be reserved at all Fresno County Federal Credit Union branches and Fresno Coin Gallery locations through Friday, Nov. 8. Visit www.dreamhome.org or call 1-800-543-5887 for directions or more information. Other sponsors of the fundraising campaign include De Young Properties, KMPH FOX 26, 106.7 KJUG, Univision Radio, The Fresno Bee, Business Street Online, Ashley Furniture HomeStore, Fresno County Federal Credit Union, Fresno Coin Gallery, Alpha Delta Kappa, Epsilon Sigma Alpha and national sponsors Shaw Floors and Brizo.